At its simplest, LaunchBar is an application launcher: you press a keyboard shortcut (Command-Space by default) and type a few letters of the name of the item you want to open, and LaunchBar displays a list of programs whose names match what you typed; if the desired program isn't the first match, you use the arrow keys to select the one you want. Press Return to launch the selected item. Because LaunchBar learns from what you’ve done before, after a few times typing xl and then choosing Microsoft Excel, you won’t even need the arrow keys—Excel will appear at the top of the list. Of course, this functionality isn’t unique to LaunchBar—other launchers, such as Quicksilver and Butler, work similarly—but it’s only the tip of what LaunchBar can do. LaunchBar can actually open any item that you can double-click on your Mac—applications, preference panes, services, files, and so on—using the same type-a-few-letters process. You can also use LaunchBar to browse folders: Once the desired folder is selected, press the right-arrow key instead of return. You’ll see the folder's contents, and you can navigate those files and subfolders using the arrow keys. In addition to opening files, you can also manage them. From within LaunchBar, you can move, copy, or paste files; select multiple files; or open files with specific applications. One feature I particularly like is the way LaunchBar taps Mac OS X's built-in Recent Items menus. For example, if I type num to get Numbers, I can press the right-arrow key to see files recently opened in Numbers, use the arrow keys to select one, and then press Return to open that file in Numbers. You can even invoke services and copy Unix file paths from within LaunchBar, and you can drag and drop items on LaunchBar’s window to, for example, open a file in the currently selected application. LaunchBar has a powerful indexing system that lets you decide which items you want it to display and which to ignore. For example, you can choose which types of items you want LaunchBar to include in its searches, and within those categories, you can choose which specific items to display. In the LaunchBar index, you can decide what you do and don't want to appear in the utility's search results. 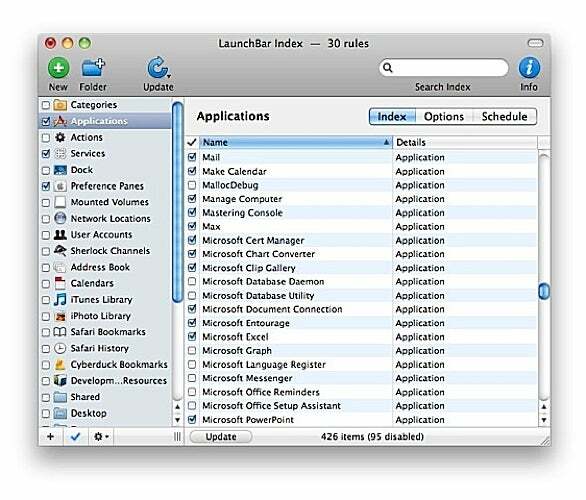 It’s been more than two years since we last reviewed LaunchBar 4. Much of what we said then applies to version 5, as well. But the latest LaunchBar offers a number of valuable new tools. The key new feature is the Clipboard history, which essentially incorporates a multiple-Clipboard utility within LaunchBar. With this feature enabled, whenever you press Command-C to copy something (text, images, and more), LaunchBar saves that item in its Clipboard history. You can press a keyboard shortcut at any time to summon the Clipboard history list and then use the mouse, or the arrow and Return keys, to select a past bit of Clipboard content and paste it into the frontmost application. If you copy and paste a lot, you’ll find this feature to be invaluable. LaunchBar has also improved its calculator. To use it, you invoke LaunchBar and, depending on your settings, start typing numbers or press the equal (=) key or the keyboard shortcut of your choosing. The calculator can perform everything from simple arithmetic to complex calculations using logarithms, exponents, fractions, parentheses and more. Whatever kind of calculation you do, when you press Return, the results display in huge numbers in the middle of your screen; press Command+C and the results are copied to the Clipboard for pasting elsewhere. LaunchBar has always provided actions you can perform on selected items; version 5 includes some new ones. For example, you can now compress files, manipulate images, quit programs, run services, and perform Web searches directly from LaunchBar; you can even use OS X's Quick Look feature to preview selected items. The only real complaint I have about LaunchBar is its complexity: It can do so much that it’s difficult to grasp it all. This is one program where reading the documentation is almost essential. If you want a tool that will streamline your workflow, LaunchBar has long been as good as it gets—and this latest version makes it even better. You’ll need to take some time to understand just how much it can do, but once you start using it, I’d bet you’ll never want to give it up. I’ve been using LaunchBar for what seems like forever, and I simply couldn’t use a Mac without it.